Welcome to wargame innovations figure painting service. We offer a first class service in terms of quality at the right price. 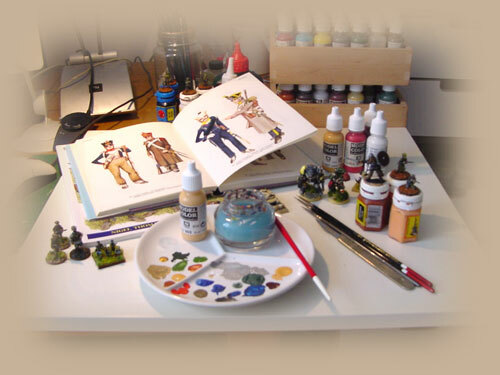 We paint only to showcase standard, being wargamers ourselves we much prefer to command units that are miniature works of art rather than hurriedly painted, mass-produced units. Our style is consistent and we take enormous pride in our finished work, each piece is researched to give you figures with historically accurate attire, but with character. To fully appreciate our quality we offer a quick turnaround sample figure service. To take advantage of this service, pick out one of your figures, send it to our mail order address along with £4.50 to cover painting/return postage. Upon receipt we will de-flash, undercoat, paint, varnish & finally base your figure and mail back to you within the week. We can base to any convention DBA/Grand Manor/Armarti/Rapid Fire etc. just provide clear instructions of base sizes with your order. Payment is requested with orders up to £100 and payments can be made by cash, cheque or postal order in Pound Sterling. Orders over £100 require 30% deposit and the balance payable upon completion of work which will be notified by post, telephone or email. (Cheques should be made payable to P Griffiths). Flags - We only paint flags moulded to the model at £4.00 per flag (all scales). We recommend the use of GMB flags. Basing - Deduct 5% (before P&P) discount if you prefer to do your own basing. Matching service - We would be pleased to match to your existing forces just send a sample with your order. Due to the nature of our business and the quality of the finished product, and the fact that we don't sub-contract our work out completions are currently running at 8 - 10 weeks. Orders are positioned in the production sequence as they are recieved at our studio. (Orders may take longer at peak times.) Every effort is made to complete them in the shortest time possible. We will confirm safe receipt of all orders upon arrival.